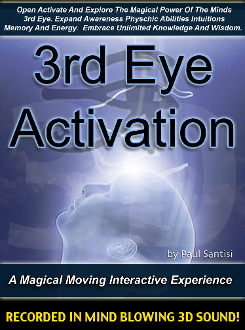 AMAZING new approach to 3rd eye activation with beautiful music and a pleasant guiding voice. Listen along and embrace yourself in this guided mediation that brings you on a magical journey of awareness and new understandings. Experience true intention and special ancient exercises that will assist anyone in obtaining all desires. A completely different and "eye opening" experience. Unlike nothing you have ever heard. Listen with headphones on. Enjoy! BONUS - MAKE SURE TO DOWNLOAD THE INTRODUCTION TO THIS MEDIATION FOR FREE! SEE PRODUCTS!